After almost two decades of marriage and fitness together, Jeremiah and Michelle have truly learned how to live a fitness lifestyle and would like to share their experience with you. Welcome to our page, where Husband & Wife team Jeremiah & Michelle Doty want to share with you everything we’ve learned regarding Stand Up Paddle boarding in the Great Northwest and all things Fitness lifestyle related in our life. Michelle is a certified Personal Trainer thru NASM. Together we enjoy all things fitness related with some of our non-paddle favorites being Mt Biking & Snow-shoeing, but of course that’s only when we can’t hit the water with our SUP’s! We have amassed a fleet of various types and shapes of Stand Up Paddle Boards thru the years. We’ve paddled on everything from cheap foam boards to full on Bark Race boards and every type and shape of board in between. We’ve played around on several brands & styles of Inflatable SUP boards and keep a handful of our favorite inflatables in our personal SUP fleet. We’ve paddled every type of lake & river from Columbia River downwinder’s to high desert lakes at 7,000’ with snow around us and every wind & water condition the NW has to offer. 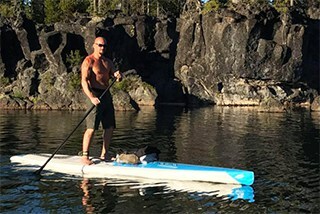 We’ve had some hiccups and made some mistakes along the way in both our Fitness Journey and Stand up Paddle Boarding, part of our goal with this website is to help other folks avoid those same hiccups & mistakes. Our SUP Blogs aim to provide very informative articles regarding different SUP Board shapes, materials, Liters of Volume and what to look for when purchasing a new or used SUP. We especially want to provide detailed descriptions of water conditions, parking, launch access and all the details that can make or break a SUP trip here in the North West. We’ve driven 4hrs to paddle a recommended lake, only to find that at anything over 8mph sustained winds in the local metro forecast means 16-18mph sustained winds on the nearby secluded lake (which is pretty much undoable with an 8yr old in tow). We hope you enjoy our Journey, and can take something positive from our experiences.